Studies indicate that over the next 10 years there will be an unprecedented number of businesses changing hands due to the retirement of millions of business owners from the baby boomer generation. It is also estimated that 90% of these businesses have not kept adequate records or documentation and are not prepared to sell. When is the best time to start the exit planning process? The answer is now! Why is it so imperative for a business owner to start the exit planning process now? Because few things are more important to business owners than the value of their business (as it is typically their single largest retirement asset). Furthermore, most business consultants agree that exit planning should begin at least three years prior to the anticipated “exit event” in order to maximize the sales price for the seller. Why is obtaining an independent, objective business valuation so important to the exit planning process? Let’s explore this by looking at the two most common ways that business owners transfer their business. The most common way that business owners exit their business is through a sale to a third party. Successful exit plans generally involve (1) establishing an accurate current value of the business; (2) establishing a desired sales price for the business; and (3) developing a strategy for how to increase the value of the business from its current value to its desired sales price. Virtually all business owners have an opinion as to their desired sales price. However, independent surveys show that most business owners don’t have a firm grasp on the fair market value of their business and often misjudge the value of their business by 50% or more. Thus, in order to establish an accurate current value, it is vital to obtain an independent business valuation from a qualified business appraiser at the beginning of the exit planning process. Furthermore, it is best to work with a business valuation expert that will not only provide an accurate current value, but one that will also actively work with a business owners’ accountant, attorney or other professional advisor(s) to devise a successful strategy that will create the additional value needed to achieve the desired sales price. In addition, depending on the time frame for the exit strategy, annual “update” valuations may also prove to be very beneficial as it allows a business owner to actively monitor the creation of additional business value to make sure that he/she is still on track to achieving their desired sales price. Another popular way that owners exit their business is by gifting and/or selling the business to their children. It is also important (and often required) to obtain an independent business valuation from a qualified business appraiser when gifting or selling the business to children (or any other family member). Such appraisal is required to establish the value for gift tax purposes or to prove to the IRS that the transaction between related parties was an “arms length” transaction. Current gift tax laws for 2016 allow an individual to gift up to $14,000 per person (“annual exclusion amount”) to any number of people and none of the gifts are taxable. If an individual gives more than the annual exclusion amount to any one person in a single tax year then a gift tax return must be filed. However, he/she still may not have to pay gift tax as each taxpayer has a lifetime exclusion of $5,450,000 (for 2016) that can be gifted during their lifetime without ever paying gift tax. Furthermore, a portion of the $5,450,000 (for 2016) lifetime exclusion is utilized only when gifts to a single person in one tax year exceed the annual exclusion amount. For example, if you make a $25,000 gift in 2016, you have used up only $11,000 of your lifetime exclusion. If annual exclusion gifts are contemplated, a valuation is required to determine what percentage of the Company can be gifted to each recipient that equals $14,000 of value. If gifts in excess of the annual exclusion amount are contemplated, then a valuation is still required to determine what percentage of the Company is gifted and the individual is required to file a gift tax return to report the gift. IRS regulations state that a “qualified appraisal” performed by a “qualified appraiser” must be included with the gift tax return in order to substantiate the value of the gift and to start the statute of limitations. Thus, it is important to utilize the services of an accredited business valuation expert (e.g. one that has obtained either the ASA, CBA, ABV or CVA business valuation designations) to assist with this process to ensure compliance with IRS regulations. Obtaining an objective, independent business valuation is a vital component to any successful exit plan for business owners. If a business owner is planning on selling to a third party, they don’t want to make the mistake of failing to properly plan for the sale of their business and miss out on their best opportunity to maximize the sales price from quite possibly their largest retirement asset. If a business owner is planning on gifting a portion or all of their company to their children or other family members, it is imperative that they consult with estate planning specialists (e.g. 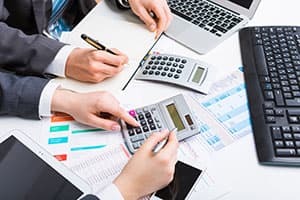 accountants, attorneys, financial advisors and business valuation professionals) to help ensure that their estate planning goals are achieved and that they remain in compliance with IRS valuation and tax guidelines.